UPDATE 4/13/16: Ian Somerhalder took to Twitter to clarify his comments. Could the end be near for The Vampire Diaries? It certainly seems that way based on what Ian Somerhalder told the crowd when he appeared at Nashville's Walker Stalker Con. "We have decided to do one last season to really do the story justice," he said, according to the convention's official twitter account. These comments come just a week after Kat Graham told US Weekly that she will be leaving the show after season eight. "Season eight will be my last season," she said. "But you know what? Another season is a whole other year, and we're going to blow it out." Nothing has been made official yet (other than the fact that there will be an eighth season) and neither the CW or WB have commented, but if Somerhalder also plans on season eight being his last, it's likely the show will follow suit, according to what co-creator Julie Plec told E! News back in January. 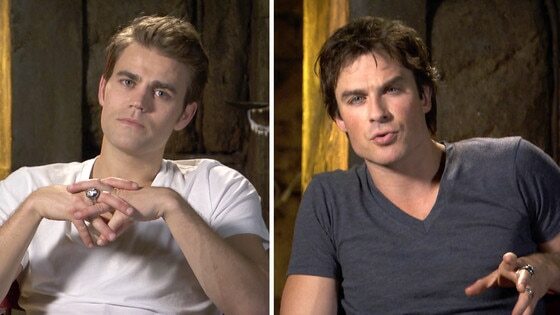 "I finally realized that my destiny on this show, creatively, is tied in to Ian Somerhalder and Paul Wesley. And I mean that in a really good way," she explained. "As long as those boys who I now consider my friends want to keep telling the story, then I won't walk away from telling the story." "When they are ready to be done telling the story, I will put my pencil down and say that I'm done too, and then we will work together to end it in the best way possible," she continued. "There's always things that could go wrong in that scenario, there's always pressure that can be put on," she said, "but…the three of us I'd like to think will make the creative decision of when the show should be over." A few months later, star Somerhalder told us that he hoped season eight would focus on the show's core characters. "I really want to make sure that we get to go back to the basics," he explained. "What made people fall in love with this story was its characters, not 40 of them, like eight of them, six of them—this core group of actors, of characters that really move you." He added, "We don't know where that's going to go but leaving the audience with the fact that by that time they will have spent eight years of their life with these people, I want the audience to feel closer, more afraid, more in love, more in tune with these characters than they ever have been." If season eight is actually the last, at least it sounds like it could make for a satisfying and beautiful ending to the series. The Vampire Diaries airs Fridays at 8 p.m. on the CW.